No wonder tech entrepreneurs are flocking to Britain from all over the world. The UK’s tech sector has accelerated ahead during Q4 of 2013, with strong inflows of new work driving the steepest expansion of business activity for almost a decade, according to the latest KPMG/Markit Tech Monitor UK report. As a result, the UK tech sector ended the year on a much firmer growth footing than it started, with a cyclical upswing first emerging in the spring of 2013 and picking up sharply since the autumn. Tech Monitor UK is a new quarterly report by KPMG, that features unique survey data from a panel of tech sector executives within Markit’s widely-watched UK Purchasing Managers’ Index (PMI) surveys, providing a reliable and up-to-date assessment of tech sector growth. 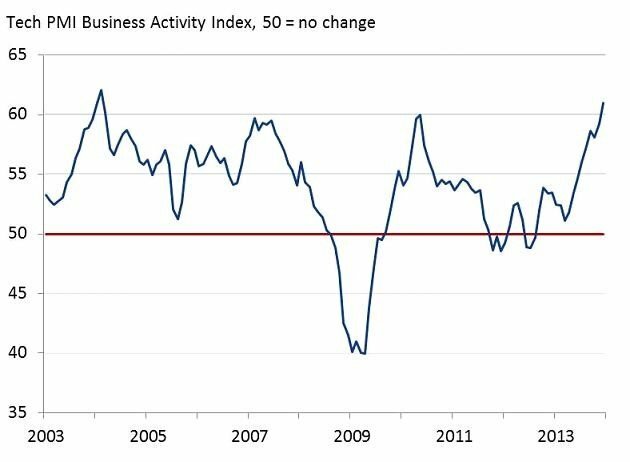 A close look at the December period shows the index measuring UK tech sector business activity posted above the crucial 50.0 no-change threshold for the sixteenth successive month – at a healthy 61.0 – which highlighted a continued strong rebound in tech growth since the soft patch reported through the summer of 2012. Indeed, tech output growth has now accelerated to its fastest since that reported in February 2004. • Almost 44% of UK tech firms plan to hire more staff over year ahead, while 7% expect a fall. • Around twice as many UK tech firms (27%) intend to increase their capex in next 12 months as those that anticipate a reduction (13%). “These figures prove once more that the UK tech sector is going from strength to strength. The last quarter of 2013 saw the sector’s best growth performance in almost a decade, with a sharp increase in business activity, a rise in new orders and an increase in profitability despite higher costs. More importantly the sector showed again solid rates of job creation, well above the rates in other sectors of the economy. “UK tech companies are also more confident about the business outlook than firms in other industry sectors, with growth expectations at tech companies well above UK private sector average, underlining the impact the sector has on the country’s economic performance and the important role tech companies play in the burgeoning recovery.